Prince PTO pumps are specifically designed for PTO drive operation on all sizes of farm tractors. No additional gearbox is required. 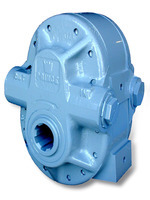 Pumps are mounted by sliding the internally splined pump onto the PTO shaft and restraining rotation with a torque arm. 2250 PSI MAX PRESSURE. 10 micron filtration required. Reservoir should be at least equal to pump GPM output. Maximum operating temperature 180 deg. F. External relief valve required - maximum setting 2250 PSI.